"Nuclear deterrence is irrational and unacceptable." 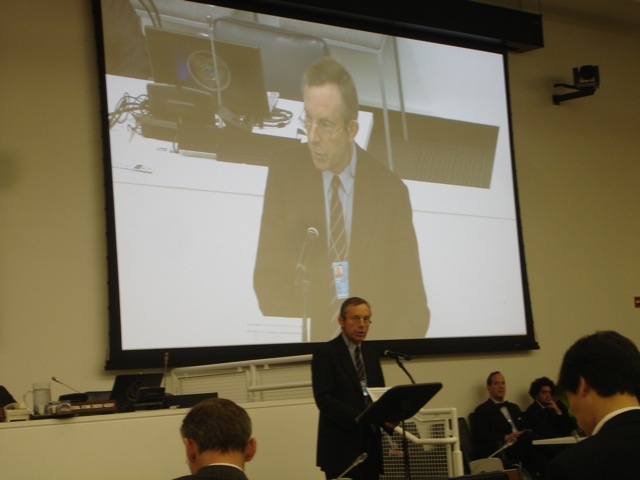 Rob Green addresses the 2010 NPT Review Conference during a special plenary session devoted to NGO perspectives. I was five days past my first birthday when 24-year-old Theodore Van Kirk, navigator of the Enola Gay, flew on the first tactical nuclear strike, against Hiroshima. In 1968, I too was a 24-year-old bombardier-navigator when told that my Buccaneer strike jet pilot and I had been chosen as a nuclear crew in our squadron aboard the aircraft-carrier HMS Eagle, and we were given a target near Leningrad. Thirty years later I landed at my target, now St Petersburg airport. I was shocked to realise collateral damage would have caused massive civilian casualties. So I went on local TV to apologise; then I warned my Russian audience that nuclear weapons would not keep any of us secure. The Falklands War opened my eyes to the dangers of a desperate leader, British Prime Minister Margaret Thatcher, having nuclear weapons at her disposal. Then the Berlin Wall was pulled down: our enemy had gone. But what forced me to break out was the first Gulf War. I warned 20,000 anti-war demonstrators in Trafalgar Square – monument to Admiral Lord Nelson – about provoking Saddam Hussein into attacking Israel, because Israel had nukes. Thirty nine Scud missiles, fortunately without chemical warheads, struck Israel, causing miraculously few casualties. But the Israeli people, cowering in gas masks in basements, knew their so-called nuclear deterrent had failed. The US rushed to give Israel Patriot missiles and more military aid – but they were just lucky. [In 1997], recently retired General Lee Butler spoke out far more powerfully than I could. He is still encouraging me to keep going. Then in 1999 I found myself leading a delegation to Tokyo not just with Lee Butler, but Robert McNamara, too. In a team of that calibre, I knew what I was doing was right. Now the nuclear weapon states, having admitted that extremists armed with weapons of mass destruction cannot be deterred, plan pre-emptive nuclear attacks in “anticipatory self-defence” of their “vital interests” – not last-ditch defence of their homeland. Thereby, their unprovable claim that nuclear deterrence averts war is cynically stood on its head. Extremists driven by religious or political ideologies would not only not be deterred by nuclear weapons. They could provoke nuclear retaliation in order to turn moral outrage against the retaliator and recruit more people to their nightmarish causes. I will never forget a public meeting in Islamabad in 2001. The nuclear physicist Dr Pervez Hoodbhoy had persuaded General Aslam Beg, one of the “fathers” of Pakistan’s Bomb, to join a panel with himself and me. Beg warned against raising awareness about the effects of a nuclear strike on a Pakistan city, “in case it scares the people.” He had a simplistic faith in nuclear deterrence, ignoring all the added dangers of a nuclear standoff with India. He is not alone: my experience is that most believers in nuclear deterrence refuse to discuss the consequences of failure. I will now confront them. Economic Consequences. In April 2005, a disturbing internal report for US Homeland Security appeared on the web. Titled Economic Consequences of a Rad/Nuc Attack, the report examined what it would take to recover from the detonation of just one nuclear device in various cities. Much depends on the size of bomb and level of decontamination, but the economic consequences for New York alone would be around $10 trillion. That is roughly the annual Gross Domestic Product of the entire US economy. Just one nuclear bomb, on one city. Environmental and Agricultural Consequences. A deeply disturbing article, published in January last year in Scientific American, reported on recent climate research about a regional nuclear war between India and Pakistan in which about only 100 Hiroshima-size nuclear devices would be detonated over cities. Apart from the mutual carnage and destruction across South Asia, enough smoke from firestorms – let alone radioactive fallout – would be generated to cripple global agriculture. Plunging temperatures in the Northern Hemisphere would cause hundreds of millions of people to starve to death, even in countries far from the conflict. Health Consequences. In 2004, International Physicians for the Prevention of Nuclear War published their findings regarding casualties from a Hiroshima-size nuclear warhead detonated over New York. Total fatalities were estimated at about 60,000. Another 60,000 would be seriously but non-fatally injured. These would clearly utterly overwhelm any hospitals surviving the explosion. Again, this is just one nuclear weapon on one city. For all these reasons, I now suspect that nuclear deterrence is an outrageous confidence trick, devised sixty years ago by the US military-industrial complex and now dominating and distorting US politics and foreign policy for its vested interests. This is also why I have written my book Security Without Nuclear Deterrence. Finding our way back from the nuclear abyss, on the edge of which nuclear deterrence has held us hypnotised and terrorised for sixty-five years, will not be easy. As with all advances in human rights and justice, the engine for shifting the mindset has to come from civil society. A surprisingly small network of individuals drove the campaign to abolish slavery. As with nuclear deterrence, slavery’s leading apologists were the power elites of the United States, Britain and France. They argued that slavery was a “necessary evil,” for which there was “no alternative.” They failed, because courageous ordinary British, American and French citizens mobilised unstoppable public and political support for their campaign to replace slavery with more humane, lawful and effective ways to create wealth. The analogy holds for nuclear deterrence, which can and must be discarded for more humane, lawful and safer security strategies if civilisation and the Earth’s ecosystems are to survive. ← The Horsemen ride again; but toward the finish line or in circles?